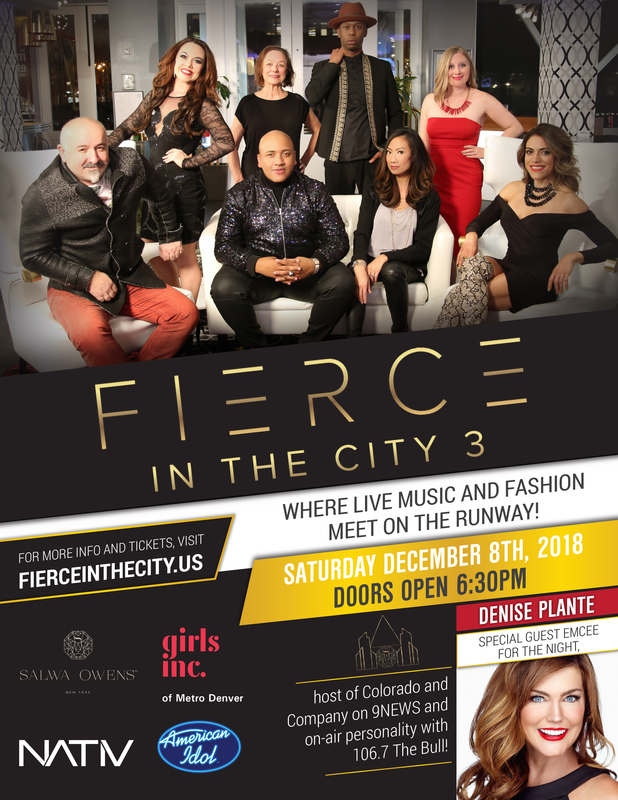 Denver, CO – The third Fierce in the City event, featuring live music performances interactively with fashion runway shows, creating a uniquely fierce experience, will be held on Saturday, December 8 at 6:30 p.m. at NATIV Hotel, 1612 Wazee Street, and will benefit GIRLS, INC. It is being produced by Denver-based Fashion Designer, Salwa Owens. The show is created with Owens’ overall mission of empowering women and will bring women from the Denver community onto the runway. Her new ready-to-wear collection will be shown on models; her new fitness collection will be modeled by influential women in the Denver fitness community; and her gowns will be modeled by past and present pageant title holders from Denver. The curated collection, which will be available for purchase that night, will be modeled by real women who are movers and shakers in the Denver community through their businesses and own individual platforms. Guest designers invited to have their own unique runway shows include jewelry designer Andrea Li, leather and fur designer Andreas Tsagas, and Marie-Margot Bridal Couture. In addition, Salwa Owens Curated Collections, featuring Trades of Hope jewelry curated by Sarena Zabilla, and hair accessories by Ella James Hattery, will be featured. The event will be emceed by Denise Plante – Colorado’s beloved host of Colorado and Company on 9NEWS and on-air personality with 106.7 The Bull. Musical performers will include Vincent Powell, recording artist and American Idol Season 12 finalist; Devan Blake Jones, recording artist and American Idol Season 12 finalist; Chase Likens, country singer and American Idol Season 11 finalist; Suzanne Simone – featured female vocalist and Ms. Wash Park 2018/2019; and featured female vocalists Kaitlyn Williams and Brigitte Ayala. Valet parking will be available at a discounted rate of $8 for guests. Doors will open at 6:30 p.m. and the full NATIV Hotel food and beverage menu will be available to guests, music will begin, and a pop-up boutique brought to you by Owens will open. Drink specials will be announced soon. The fashion show will feature runway segments along with performances from the featured artists and will begin promptly at 7:30 p.m. After the fashion show, guests are invited to stay for an after-show party and meet and mingle with everyone in the show. Music, shopping, and socializing over food and beverages will continue until 10 p.m.
Tickets are $65 for VIP reserved front-row or table top seats which include a complimentary glass of champagne, $55 for general admission non-reserved seats, and $30 for standing room. Rows other than front row will sit first-come, first-served. Guests can receive $4 off per general admission ticket by purchasing a four-pack of tickets. Early bird tickets will be available through September 10 for $5 off. Complimentary valet parking will be available. Tickets are available at www.eventbrite.com.